The New Picture House on North Street. Image courtesy of University of St Andrews Special Collections. Over time North Street has housed an odd mix of old and new with a medieval cathedral and the centre of a six hundred year old university positioned alongside two cinemas and, more recently, a department of Film Studies. The presence of these modern cinemas within this ancient religious and educational centre has greatly shaped how cinema has been perceived and enjoyed within St Andrews over the last century. 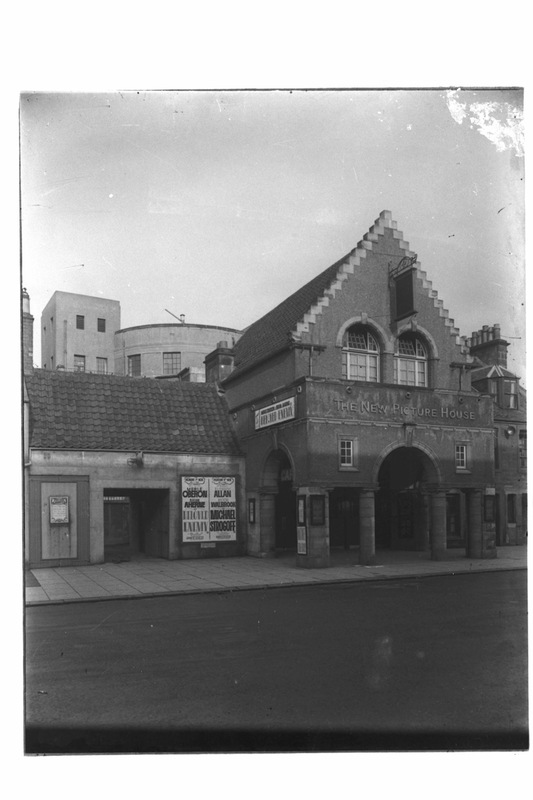 The first permanent cinema in St Andrews, The Cinema House, was opened on 4 December 1913 by Provost John Herkless, who was a former Divinity professor at the university and thus represented both the religious and educative elements of the town. Herkless and the Town Council had already rejected a proposal to install a cinematograph box in the Town Hall earlier in the year and so the approval of the Cinema House came somewhat out of the blue (St Andrews Town Council Minutes, January 1913, p. 261). Herkless told the St Andrews Citizen that, originally, he was unhappy with the plans as he felt that the cinema would be better placed in a less conspicuous street (St Andrews Citizen, 30 November 1963, 6). He explained that it was the idea that the cinema would serve as ‘a place of education’ that finally changed his mind. The location of the cinema almost directly facing St Salvator’s quadrangle, therefore, was imagined from the outset as a way of incorporating the cinema into the town’s educational heritage. Herkless’ initial opposition to the cinema is indicative of widespread concerns expressed both within the town and beyond about the physical and moral ‘safety’ of the cinema. The local and national press were filled with stories of accidents and also of immoral activities that occurred when large numbers of people gathered unchaperoned in the dark cinema space. Articles with titles such as ‘The Threat of Cinema’ and ‘Cinema Exhibitors and Juvenile Delinquency’ were commonplace in 1913 (The Scotsman, 6 October 1913, 10; The Scotsman, 7 May 1913, 11). In March 1930, the Town Council cited a letter from the Educational Institute of Scotland calling for new, tighter legislation. This legislation concerned both the physical safety of the cinema space – only non-flammable film should be used and smoking in the operating box should be strictly forbidden – and also the moral function of the cinema. It now called for more adult supervision in cinemas and stated that no child under school age should be admitted. The council stated that these issues were of the upmost importance to St Andrews in light of the recent cinema disaster in Paisley (St Andrews Town Council Minutes, March 1930, 259). On Hogmanay 1929, 71 children lost their lives after nitrocellulose film ignited at a screening at Glen Cinema, Paisley. So many children lost their lives, not because of the fire, but because of the subsequent crush as children rushed to exit the building. Tragically, the doors had been locked to prevent children from entering the cinema without paying (The Scotsman, 20 June 1930, 10). Not long after this event, on 2 June 1930, St Andrews Town Council approved the building of a second cinema on North Street (St Andrews Town Council Minutes, 2 June 1930, 259). The Council stipulated a series of conditions on approving the building’s construction, which responded directly to the disaster at Paisley. Firstly, the foyer had to be from the open air, there had to be panic bolts on doors and the curtains could not be made from a flammable material. While in 1913 the location of the cinema on the historic North Street had proved contentious, by 1930 this location may have helped in gaining approval for a new cinema. In medieval times, North Street had to accommodate large numbers of pilgrims coming into the town and is a notably wide street. During the Second World War, the cinemas were actually criticised by a warden in The Citizen, because people could spill out of them in huge numbers during an air raid (The Citizen, 23 September 1939, 5). In the immediate aftermath of the Paisley disaster, the open spaces outside the cinema were especially appealing. Certainly, the physical dimensions of North Street, as a wide street able to accommodate many people, helped the cinemas to house long lines of people. The medieval landscape of the town, therefore, has in an odd twist of modernity become the perfect setting for cinema.